Every year for as long as I can remember i’ve brought you guys a Valentines gift guide and this year is no different. Even though I am single as single comes I do like Valentines day and the idea behind it, however I use the day to celebrate the people in my life that I love, that be my family and gals of who I couldn’t be without but there are couples out there who enjoy celebrating the day and there is not a single thing wrong with that. So if you’re stuck for Valentines gift ideas then i’ve got you covered! I say this every year but sometimes knowing what to buy someone for Valentines day can be the hardest decision in the world to make especially if it’s your first Valentines with someone. Hopefully this gift guide gives you some ideas, baring all budgets in mind here as Valentines doesn’t have to be expensive and it’s the thought that counts (for me anyway). An obvious choice when buying for any girl would be a beauty related item, so this gift guide is fairly beauty related (however I have linked more trinket/non beauty items below) as you can’t go wrong with one of her favourite products, you know the ones that get repurchased over and over again, or whether it’s something new that you think she might like. A winner I think in any girls eyes is anything from Charlotte Tilbury of who I feature a lot but her products are just to die for and if any man bought me anything from CTilbury herself then he is the one. A firm favourite of mine and a lot of my gal pals is the Filmstar Bronze & Glow* (£49) as this is my go to palette for bronzer and highlighter, and after a good year on i’ve still not hit pan even though I use this everyday! Another brand of who I think do gifting really well is Ted Baker. Their packaging is always beautiful with their pretty florals prints and their products just ooze sophisticated femininity. For my Mums birthday I gifted her the Ted Baker Fragrant Bloom Birthday Box (£18) but this would make a perfect present given any occasion with Valentines being one of those occasions! As well as this gift set, they have an array to choose from to suit different budgets so if you fancy browsing their range you can do so here. 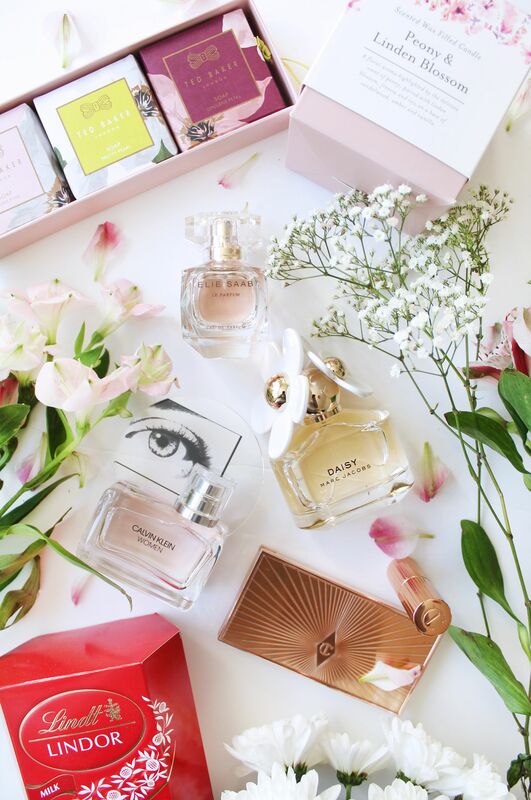 Moving onto the main focus of this blog post and the most obvious beauty item you can gift anyone for Valentines and this is of course fragrance! If you’ve read my blog for a while then you’ll know a personal go to for me is Fragrance Direct as they stock thousands of fragrances all for lower than the RRP and stock most major fragrance brands. 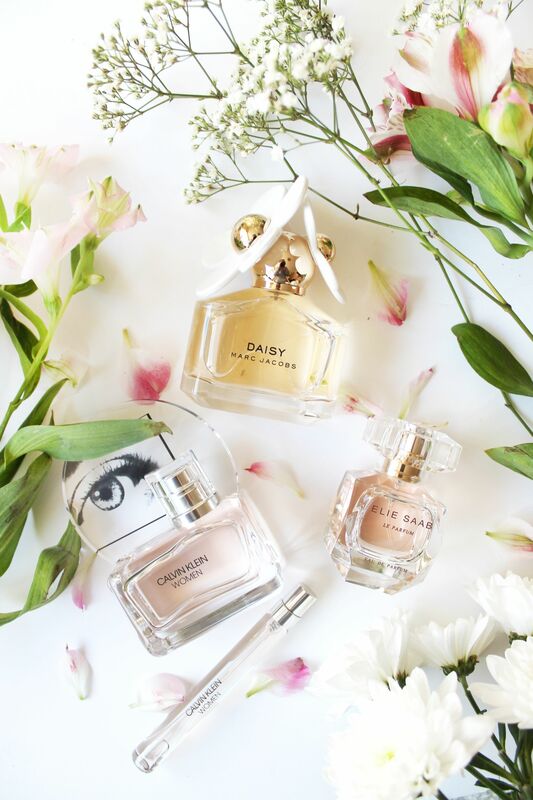 A personal favourite of mine amongst a lot of women out there are the Marc Jacobs fragrances and you can’t go wrong with the classic Marc Jacobs Daisy Fragrance* (£45.99). For me it has been my go to for years and everyone always compliments me whenever I wear it, and similarly if I recognise someone else wearing it I always think ‘this girl knows’. It’s a beautiful floral yet sweet fragrance that is girly but still sophisticated and is one I think any girl would love. Another fragrance that is new to me but has totally got me thinking I need to switch my everyday fragrance choice, is the Elie Saab Le Parfum* (£34.95) which again is a beautiful floral scent, one that any gal out there would love. What I really like about this fragrance is the packaging as it’s elegant and sophisticated, but it’s also fairly small so would fit in any handbag perfectly so you can top up on the go! Finally the last fragrance pick i’ve got for you is the new Calvin Klein Women Gift Set* (£38.95) which comes with a full size of the fragrance and then a travel size 100ml which means you can top up on the go without having to take the full size. I’ve seen and heard a lot around this fragrance and I now know why because it smells incredible. I’ve always been a fan of Calvin Klein as my Mum has worn their fragrances on and off for the majority of my life, and if Calvin Klein know how to do one thing.. it’s a fragrance! Finally as previously mentioned, a great Valentines gift would be something for the home especially if you live with your partner. Whether it be a candle or a his and hers style gift, i’ve linked a few options above that would make a fab gift! What are you doing for Valentines this year?